"The difference between doing voiceover work in animation or in real movies — as opposed to video games — is slight. I mean, you know, acting is acting. It's either good acting or it's bad acting." Those voices you hear in Cartoons, Anime, Video Games, Puppet Shows, and Commercials don't exist in a vacuum. While not quite as famous as regular live-action actors, these folks still get a lot of mention among fans for their distinctive style and/or extensive catalogs. This index page is meant for actors whose primary career is in voice work, or at least have an extensive history of voiceovers. Don't bother listing live-action actors who also happen to do a rare voiceover. There is considerable overlap between this list and Names to Know in Anime. See also Puppeteers. Casey Kasem — "Keep Your Feet On The Ground, and Keep Reaching For The Stars"
Don LaFontaine — we now live In a World... where he can no longer do these trailers. 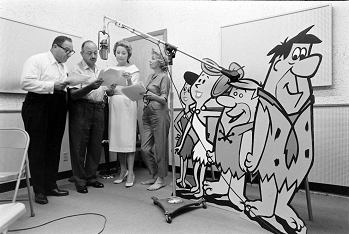 June Foray — The First Lady of voice acting.